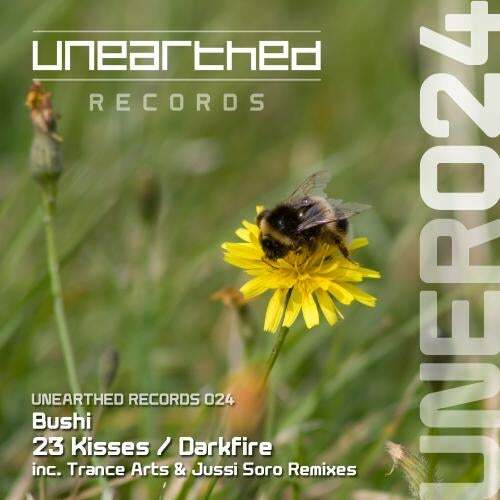 Unearthed Records welcomes Matt Allen who brings us 2 awesome trance tracks under his alias Bushi. 23 Kisses is the first track and is a sublime blend of the melodic and euphoric featuring one of the most enchanting piano riffs possibly ever written in trance music and an equally strong melody to complement it. Hands in the air all round. First up on remix duties is Trance Arts who has seriously gone to work on the track and pulled out all the stops. With his signature pounding beat, massive rolling bassline and hugely uplifting and powerful synths, Torsten has once again created something a little bit special! Next up is an awesome remix from Jussi Soro. Jussi has possibly made the original track even more epic with some superb acid riffs, an incredible emotional breakdown and excellent drive throughout the track making it perfect for dropping peak time in a club. Finishing off the release, Matt brings us the b-side which is entitled Darkfire. As the track name suggests, Darkfire is a on the dark tip with groovy percussion, evil stabbing synths, exquisite arpeggios, another incredible piano line and perfect driving bassline. We can't wait to bring you Matt's next release!